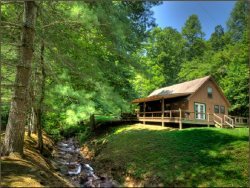 Relaxing getaway cabins in the Great Smoky Mountains near Bryson City and Cherokee, NC. Mountain View Overlook - where luxury, peace, and relaxation unite. Perched in the trees overlooking the beautiful Smoky Mountains of Bryson City, this beautiful home offers long-range mountain views, ample space, and a luxury spot for your mountain vacation. Mountain View Overlook is a three bedroom, three bath home that sleeps up to six guests. This lovely home has large living spaces, which is perfect for you and your family or group. The living room features a floor to ceiling rocked gas log fireplace, large flat screen television with Direct TV service, comfortable seating, and plenty of windows and natural light where you can enjoy the views from the comfort of your couch. The fully stocked kitchen is the perfect spot to whip up a meal right in the comfort of your home, complete with granite countertops, stainless appliances, and ample dining space. The large master suite is located on the main level just off the living room and features cathedral ceilings, access to the deck, flat screen television, and private master bath with claw foot soaking tub and glassed shower. The lower level of the home features two additional bedrooms, each featuring a queen sized beds. For guests convenience there is also a bath featuring tub/shower combo and laundry room. The outdoor space of Mountain View Overlook is nothing short of amazing. There are two levels of decking, both of which have gorgeous long range views of the Smoky Mountains. The upper deck level is massive. There's plenty of space for enjoying the outdoors, outdoor dining, gas grill, and gazebo. It's the perfect spot to enjoy the mountains, right from the comfort of your home. Mountain View Overlook is located right outside of downtown Bryson City. It's a perfect spot for those wanting to explore all our area has to offer. It is within five minutes to the Great Smoky Mountain Railroad with the Polar Express and Great Pumpkin Patch Express, delicious local restaurants, adorable boutique shops, and the Deep Creek area with tubing, fishing, and hiking. Cherokee NC is about a 15 minute drive away where you can access the Great Smoky Mountain National Park, Harrah's Cherokee Casino, and explore the Cherokee Indian Reservation. The Nantahala River Gorge which offers whitewater rafting, kayaking, and zip line tours is about a 30 minute drive. Staff was amazing at helping me get the cabin booked. The cabin was absolutely gorgeous! The master bathroom is amazing and the cabin as a whole was just cozy and relaxing. I will definitely go back!! Very friendly and flexible. We had a challenge with a loss in the family earlier this year, however the team was considerate and provided guidance on rescheduling. We even received an email making sure we didnt forget! The views and kitchen are wonderful! We have been using Hidden Creek Cabin Rentals for 8 years now. We love the ease and the wonderful places. And thanks for the heads up on the bear from the maintenance team. When he stole the trash can we knew what happened. Just a short trip up the mountain to retrieve it and the trash (and some trash from past bear antics) and we moved right along. PS - The bear doesn't like it if you leave the portico light on where the trash can is located. He did not visit once after we started leaving it on at night. The property is gorgeous. I wish we could purchase it at this time! I would gladly spend forever there! Everything is perfect, from the decks to every single room in the house. I would love to see better lighting in the master bath, but aside from that and the lights being out by the hot tub, it was great! The service was great. One question about wi-fi was quickly answered. Could not expect better service. Beautiful view from the deck as the full moon came up over the mountains. Such a comfortable home away from home that were going back in two months. We celebrated my husbands seventieth birthday with two other couples. We all loved the beautiful Mountain View and the luxurious amenities. Inspite of rainy weather, we were able to enjoy both inside and outside. We used the decks, the gazebo and the hot tub! We used it all.